The Cooks Next Door: Weekend Fare & A Giveaway! Weekend Fare & A Giveaway! It's hard to believe the end of the week is nearly here! I finally am getting back in to the cooking groove - just in time to leave. :) This week I made a salad with chicken and veggies, bbq chicken pizza, and today's featured recipe - chicken salad. Yes, it was chicken week. I cooked four chicken breasts on Monday and made them last for three meals. It worked well and everyone enjoyed the dinners! 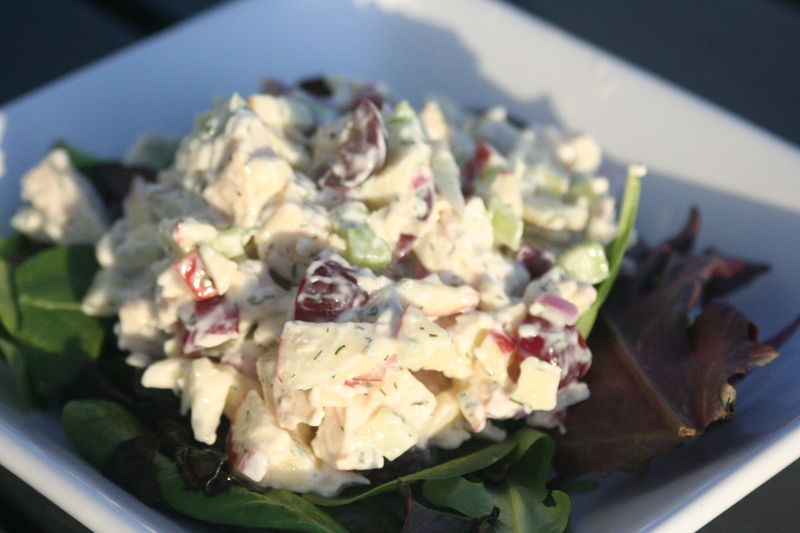 A good chicken salad is wonderful and yet I have a hard time finding it. I vary mine with one exception - it always has some kind of fruit in it. The fruit is often grapes but I've also used craisins and various other things. My version today includes apples as well as grapes. I like the natural sweetness the fruit adds as well as the color! Combine all ingredients. Serve over spring greens or lettuce or as a sandwich filling. (We really liked this served over the greens with water crackers on the side). Serves about 4. Nothing like waiting until the end of the month for our giveaway! 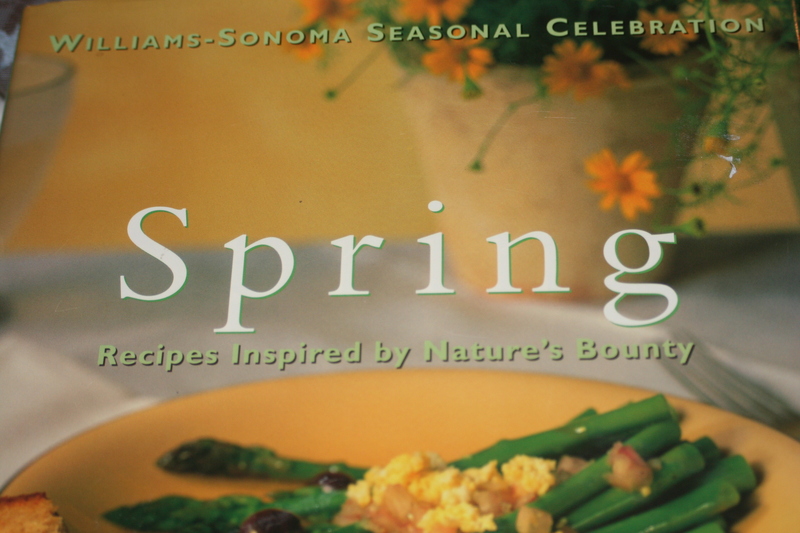 This beautiful cookbook is the Williams-Sonoma Seasonal Celebration Spring book by Joanne Weir. The pictures alone will inspire you to try recipes and experiment with spring produce! It offers recipes such as Fresh Pea Soup w/Lemon Creme Fraiche, Asparagus-Parmesan Cheese Puffs, Spicy Deviled Eggs, Spinach & Bacon Souffle, Lemon Cloud Tart, and many more. - Leave a comment on this post telling us your favorite cookbook or spring recipe. There you go! You could earn as many as 7 entries. And if you already are in our group, subscribe etc, let us know and we will add in the extra entries! I leave tomorrow so I will try to close the giveaway sometime next week but the winner will not be announced until after May 9. I love cookbooks. I will say that I love the cookbooks from Ina Garten and the Barefoot Contessa series. Great giveaway, thanks!! My favorite spring recipe is the Lemon Cloud Tart! I join your facebook group – The Cooks Next Door! Well, I am entering because I would like a cookbook with some good recipes. I don't have a favorite right now. Though, there is a taco wrap recipe I love in one of the Pampered Chef cookbook. I have only made one thing from any Barefoot Contessa book that I didn't like (garlic chicken). I serve her recipes even to company without first testing them because they're always wonderful. LOVE her books! Funny trend I see here -- I too love Ina Garten. I just got the family style cookbook and its great. Her recipes are simple yet delicious, and presented beautifully. Thanks for including my book. I wrote that book a long time ago but I still love that whole seasonal series I did with Williams Sonoma. And yes, we all love Ina too! I'm happy to do a summer giveaway if you like. It would be a book in the same series. Favorite receipe or book is a hard one to pick. But at Easter I made this milk chocolate frozen pie, with a graham cracker crust and topped with crushed toffee and was pretty darn good if I say so myself. the warmer weather always makes me excited about grilling and one of my favorite things to make are kabobs. :) usually chicken with a variety of veggies and then some grilled pineapple and rice on the side. i have subscribed to your blog as well as joined the facebook group and you are definitely on my blog roll. Texas spring = sunny and hot!!! We also enjoy salads with lots of fresh veggies and cold rotisserie chicken (from the grocery store). And for dessert -- Key Lime Pie. My recipe only requires a 6-8 minute bake time. The chilled pie with lots of whipped cream is perfect for a warm afternoon treat! I have to be honest and say that i don't cook that much, which is why i'm entering this to get some good ideas! But i did make these stuffed mushrooms once, and they turned out perfectly! They tasted just like Olive Garden's stuff mushrooms, i was so proud of myself! I love spring and one of my favourite cookbooks is The Japanese Kitchen by Kimiko Barber. Rebar is also a new find that I really like. I love Williams-Sonoma cookbooks! This one looks like it has some amazing recipes. I don't really have a favorite spring recipe except we have been making a lot of spinach salads recently with strawberries, candied walnuts or pecans, blue cheese, dried cranberries, green onions and homemade balsamic dressing. My favorite recipe for spring and summer is steak and shrimp kabobs with grilled vegetables. My favorite cookbook I just got and I'm obsessed with it--it's Chocolates and Confections at Home with The Culinary Institute of America --it is amazing! I love spring recipes! My husband and I are making an effort to cook seasonally. We have a large vegetable garden and this is our second year with it. We're hoping to get quite a haul this year so we want to learn how to cook with things we would have around this time of year. I subscribe in google reader to your blog and check it out all the time. You're also on my blog roll at http://thisoldknit.blogspot.com. :) Grats on the baby in bloggy land and keep up the great work! One of my very favorite cookbooks is Vegetarian Cooking for Everyone by Deborah Madison.